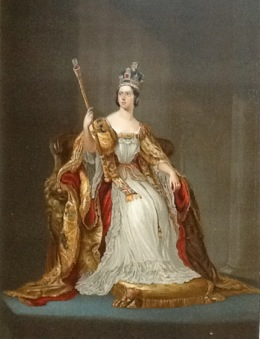 Victoria was eighteen when she became Queen. It was five o'clock in the morning when the Archbishop of Canterbury and the Lord Chamberlain knocked at the door of Kensington Palace with the news that her Uncle,William the Fourth, had died. Everyone was asleep,and they had to knock and ring for some time before they gained admission. The new Queen greeted them in a long white nightgown,a shawl around her shoulders and slippers on the royal feet. The first words she spoke were to ask the Archbishop to pray for her; all three of them knelt and prayed for this young girl who had inherited such great responsibility. 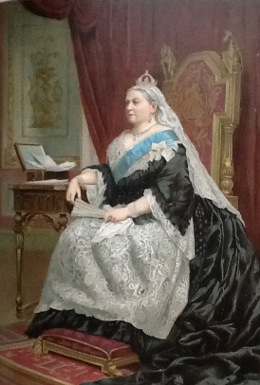 Fifty years later,when the Empire celebrated Victoria's long reign,she could look back at a period of enormous change. Large parts of the world were under British rule:maps of the time showed many areas coloured pink. British explorers & missionaries had been actively 'civilizing' the rest of the globe,taking respectability, clothes & disease into primitive communities. Inventors,architects and engineers had transformed society - steam-power & machinery brought mass-production, the railways carried thousands of country folk into London and the new cities, steamships and gaslight and the first anaesthetics were miracles of the age. BUT....there was a hidden,dark side to Victorian society. None of these great advances applied to the large numbers of poor people in the rapidly developing cities who lived in the slums, or 'Rookeries' as they were called. For them, life was an appalling struggle. As the new railways took over more and more land,slum-dwellers were forced to crowd into less space. No wonder they were called the 'Residuum' - they were truly the dregs of society, and lived and were treated as such. There were no sewers:perhaps 25 families used one outside privy: so-called 'Lavender-men' shovelled up the sewage weekly, piling it on a cart and dumping it in the Thames. It was believed that cholera & typhoid were spread by bad air(malaria),but of course the infected Thames spread death and disease throughout East London. In 1860, half the population of Wapping were wiped out by cholera. Over a third of the children of the poor died before their first birthday. Families lived on a diet of bread and tea,perhaps with an occasional herring or scrag-end,some days with nothing; they all worked,even the little ones,folding envelopes,making matchboxes(1penny for100),fixing bristles in brushes, filling mattresses with straw. If there was no work there was no bread. Some mothers went out cleaning or washing and had to lock their little ones in,often without food or company, all day. Many children lost their families through drink,disease,brutality & neglect. At a time when Great Britain was gaining influence and industrial strength out of all proportion to its size, thousands of poor children in London and the other growing cities were homeless & living on their wits in the streets. Their condition passed unnoticed by many of the population,who were proud of the wonderful new developments and excited by the benefits of scientific discoveries; but there were those who worked all their lives to improve the lot of these lost and unprotected children. Henry Mayhew, Dr. Barnardo, Charles Dickens,and the Earl of Shaftesbury each in their way helped to improve the lot of the street children,setting up Ragged Schools, publishing interviews, working to alleviate conditions. Slowly people were made aware of this Black Hole in society; even Queen Victoria's eyes were opened to the fact that children from the age of 5 or 6 were living and sleeping on the streets and working or stealing to keep themselves alive. Some of the interviews with the watercress-sellers and mudlarks published by Dickens and Mayhew are very touching. I intend to include these in this section of the website. For some years I worked as a volunteer in the Ragged School Museum, and hope you will also enjoy some of the history of the Ragged School Movement, which transformed the lives of so many of the street children.